Sangkacai Wat Prasat BE2506. White Green color, most niyom. Mixed with lots of holy material from more than 300 temples, such as old somdej Wat Bangkhunprom, old somdej Wat Rakang, Luang Phor Thuad Wat Changhai BE2497, powder from Luang Phor Sodh Wat Paknam, leftover powder from Somdej Phau BE2495 and others. First grand blessing ceremony on 6th to 9th March BE2506, attended by 234 monks and blessed for 4 days 4 nights. Second grand blessing ceremony on 13th to 15th November BE2506, attended by 108 monks and blessed for 3 days 3 night. It comes with Samakom Authentic Certificate. First Batch Toe Moo Taimak (rain retreat 3 months blessing) LuangTa Boonnar, Wat PaSotThiPol BE2542. Herb material, front with Luangta’s jeevorn. First Batch Phra Kring Arahant Luang Phor Waen Sujinno Wat Doimaepang BE2517. Nur Nawa. The material mixed with written yant copper plate from Luang Phor Waen, Luang Phor Khao, Chao Khun Nor and Phra Kring from Wat Suthat, Wat Pikulthong and others. Luang Phor Waen blessed 3 times for this Phra Kring. It comes with PraMuang Authentic Certificate. Attached with Gold Waterproof casing. First Batch Garuda Kruba Khamfan Wat Korchoke BE2560. Nur ThongTip. It won No2 Placing in Thailand Chiangmai Grand Amulet Competition on 21st January 2018. 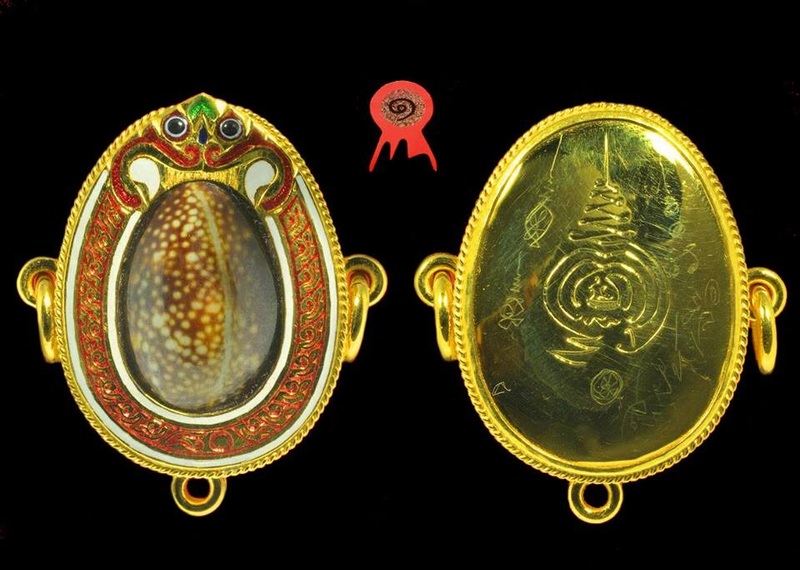 Biagae Phim Yai Gold casing Luang Phor Cher Wat KlangBangKaew BE2548. Made during LP’s 80 years old birthday. With LP’s handwritten yant. 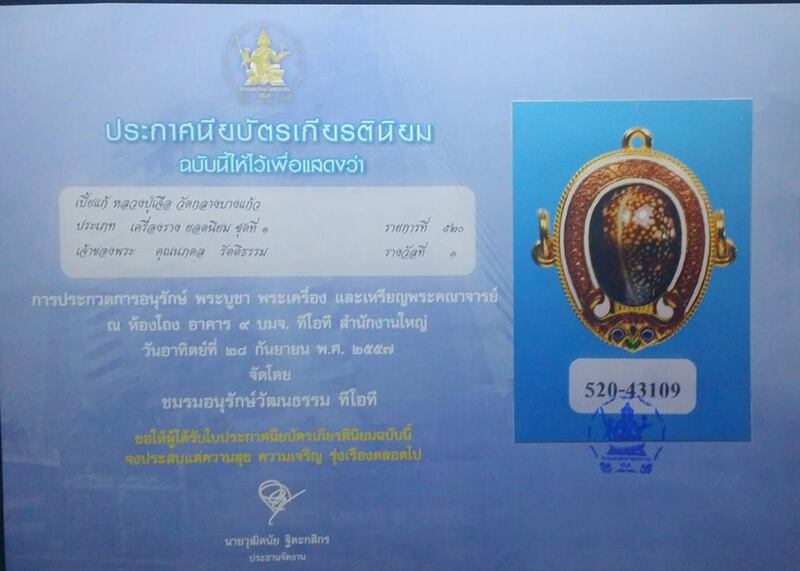 It won No1 Placing in Thailand TOT Grand Amulet Competition on 28th September 2014. It won No2 Placing in Thailand Chaeng Wattana Grand Amulet Compeition on 4th October 2015. First batch Silver Phra Phrom Rian Luang Phor Pherm Wat Pom Kaew BE2544. Nur Ngern, made 311 pieces only. It comes with LP’s handwritten yant. It comes with Samakom Authentic Certificate. Pidta Phra Kru Sang Wat Inn BE2485. Very rare in market. Mixed with old powder from his master Luang Phor Phoo Wat Inn. Co-Blessed with Luang Phor Nak Wat Rakang, Luang Phor Sodh Wat Paknam, Luang Phor Phuerk Wat King Kaew, Luang Phor Chong Wat Natangnok & others. It won No2 Placing in Thailand Phitsanulok Grand Amulet Competition on 17th July 2016. Attached with Silver Longya Waterproof casing. Phra Kru Sang born on 1st August BE2431. He was the disciple of Luang Phor Phoo Wat Inn. His Somdej is one of the best alternative for somdej by Somdej Toh or Luang Phor Phoo.